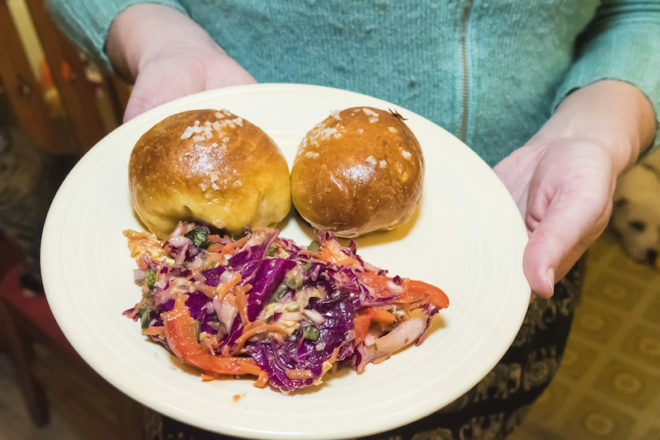 Cabbage is king when it comes to slaw. Traditionally, the base ingredient in coleslaw is cabbage and will always be cabbage. When eaten raw it takes on the flavors of the things it is melded with, and cabbage is packed full of vitamins and minerals, all the stuff that’s good for you! Cabbage is a colder weather crop, which grows great in our cool climate and short growing season. For all you gardeners out there, cabbage is the perfect hardy Wisconsin crop. The plants can be planted outdoors in early May. Some varieties are ready to harvest in 60 – 70 days and other varieties take up to 100 days. Cabbage is a beautiful plant in all its stages. It adds texture and vibrant colors to your garden. When cutting a head of cabbage in half (especially the red variety) take a moment to honor the artful layers of the veiny labyrinth — in my opinion it’s some of Mother Nature’s best work! Coleslaw comes in many varieties, creamy or oil and vinegar-based. It is adaptable and delicious. Coleslaw is a simple salad that can be tossed in short order to make a simple dinner fantastic! 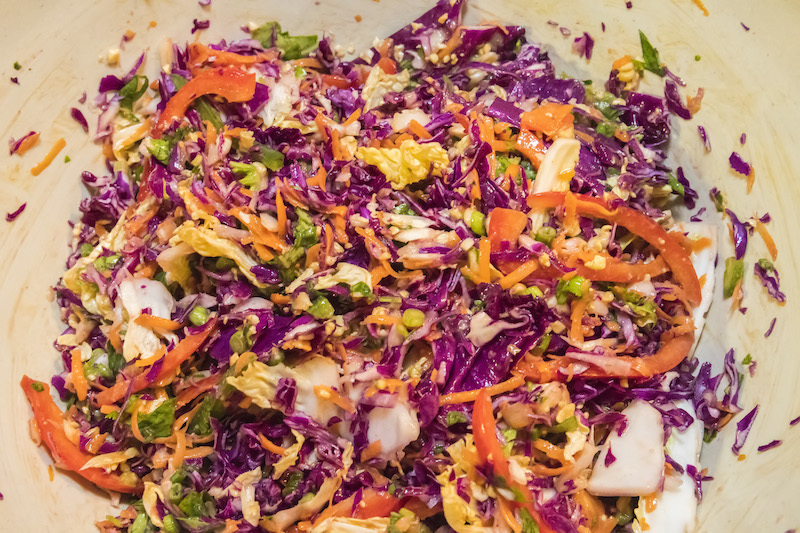 As much as I love cabbage and will continue to incorporate it into my slaw, I encourage you to think outside the box and get creative when tossing together a crunchy spring salad. Mix all prepared vegetables and herbs in a big bowl, set aside. In a jar, add all the dressing ingredients, cover with a lid and shake vigorously until all ingredients are mixed together. Pour the dressing over the vegetables and stir until everything is coated. Add the chopped peanuts and grated ginger root. Salt to taste. 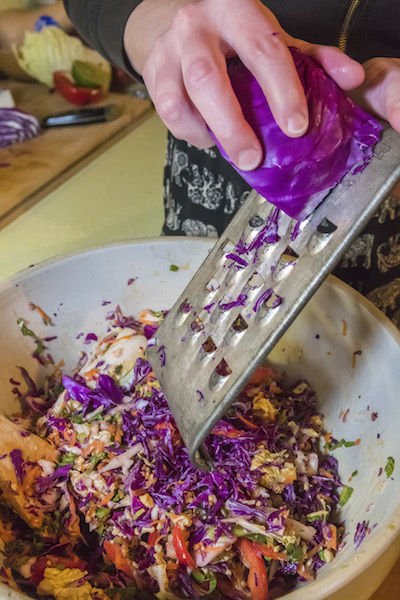 The slaw should sit for 15 – 30 minutes before serving so the dressing and flavors have an opportunity to meld. Enjoy! In a jar mix all the dressing ingredients together, shake vigorously until all is mixed. 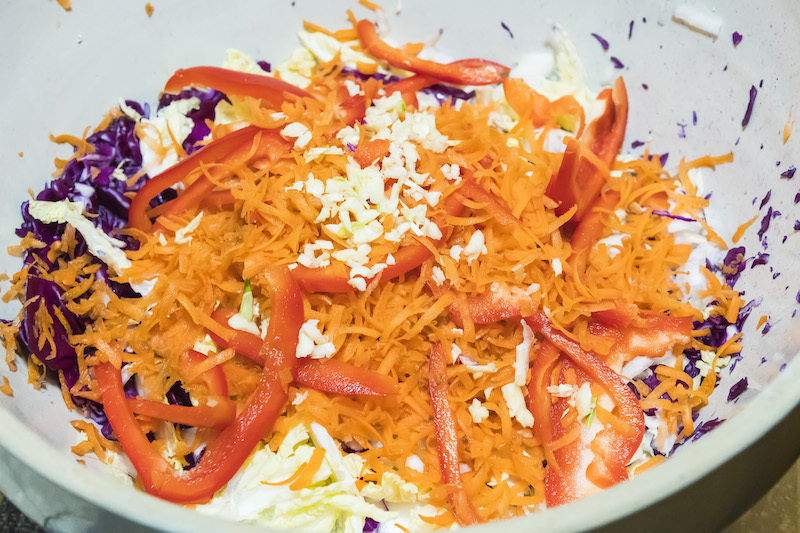 Pour the dressing over the prepared carrots and cabbage, mix it up until all is coated. Let the slaw sit and marinate for 15 – 30 minutes before serving. Dressing can be made up to a day in advance for best flavor. Place all prepped fruit and vegetables in a bowl. Shake up the dressing ingredients in a jar or whisk in a bowl. Pour the dressing over the veggie mix until well coated. Make the dressing in advance for best flavor.